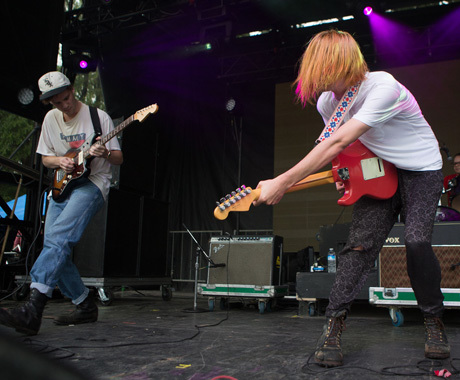 Before Chicago-based indie rockers Smith Westerns had even taken the stage at Toronto's TIME Festival on Saturday afternoon, it was clear they were the odd men out at a festival dominated by laptops and turntables. This thought wasn't missed on lead singer Cullen Omori, who made Linkin Park jokes and teased the crowd about wishing they had brought a DJ. Starting out with Soft Will's Suede-esque standout "Fool Proof," the jangly and atmospheric rock outfit began a set that relied heavily on their most recent album while occasionally dipping its toes into the past. Not like the crowd noticed. It was hard to find a single audience member mouthing the words to any of the band's meticulous pop songs, a fact that wasn't lost on the band's bassist Cameron Omori. Judging by his animated arguing with the sound guy side stage before their set, something was wrong with his monitors. Unable to hide his displeasure in performing, the older Omori stared listlessly into the crowd, playing only the mandatory notes on his bass needed to get through renditions of "All Die Young" and "Varsity." "Can you make the bass drop?" Cullen jokingly asked his brother in an attempt to cheer him up halfway through. Cameron shook his head side-to-side in response, then remained seated by his amp for what felt like the remainder of the performance. Qualms with their sound aside, the chilled-out quartet still managed to squeak out a few solid numbers, including "Smile" and "3am Spiritual," but it was clear pairing this band with such a party-ready crowd probably wasn't the best idea.